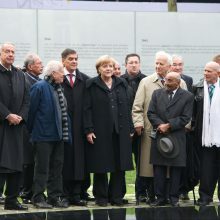 On 24 October 2012 the Memorial to the Sinti and Roma of Europe Murdered under the National Socialist Regime was inaugurated in a solemn ceremony in the presence of Federal President Joachim Gauck and Federal Chancellor Angela Merkel as well as numerous survivors of the genocide. 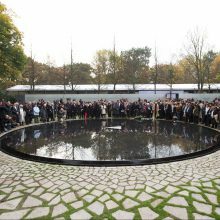 The memorial site designed by renowned artist Dani Karavan is situated between the Brandenburg Gate and the Reichstag [parliament] building. 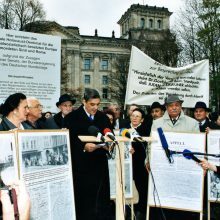 The political struggle over the precise location and concept for such a memorial had lasted more than twenty years. 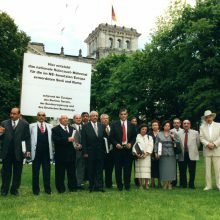 With this central memorial site in the heart of Berlin, the Federal Republic of Germany emphatically underscores its own commitment to a particular historical responsibility towards the Sinti and Roma. 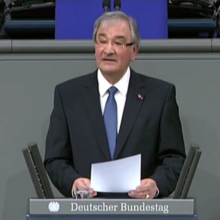 03 | Excerpt from Zoni Weisz’s (*1937) address at the Bundestag. 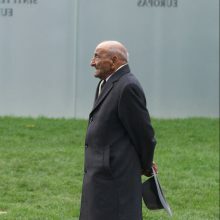 Genocide survivor. 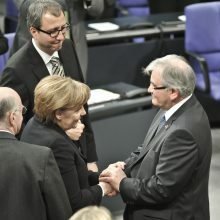 On 27 January 2011, Weisz, a Dutch citizen, was the first Sinti and Roma survivor to speak to the German Bundestag. 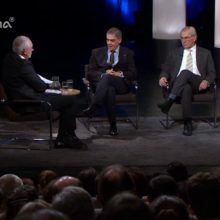 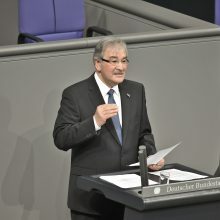 Statement by Romani Rose, chairman of the Central Committee of German Sinti and Roma at an event at the Munich Volkstheater on 19 February 2017.